Clifford Frank Hinchey3,4,5,6,7,8 [Clifford Hinshaw9]. Hinchey, Clifford, son, age 25, born in Tennessee; parents born in Tennessee; first married at age 24; occupation: laborer, farm. Hinchey, Juanita, daughter-in-law, age 19, born in Tennessee; parents born in Tennessee; first married at age 18. 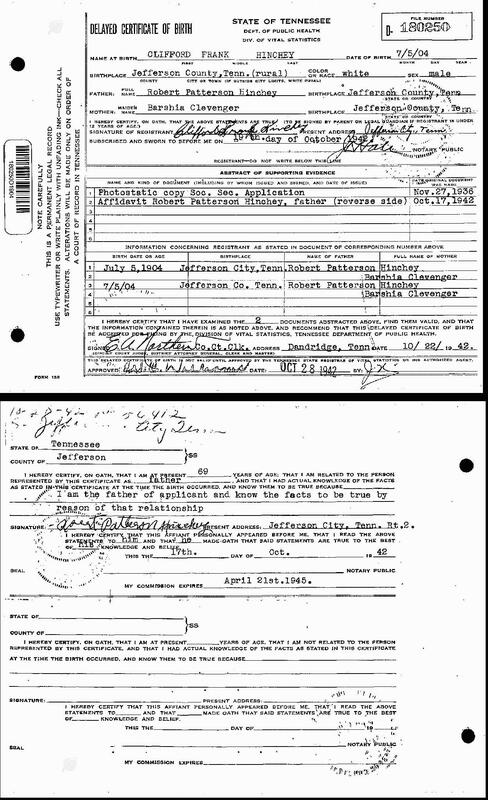 Hinchey, Clifford, head-of-household, age 35, born in Tennessee; completed 8th grade; on Apr 1 1935 was living in the same place/city; rented home ($5/month rent); occupation: inspector, spring factory; worked 52 weeks in 1939; $840 wages in 1939. Hinchey, Juanita, wife, age 28, born in Tennessee; completed 2 years of high school; on Apr 1 1935 was living in the same place/city. Hinchey, James, son, age 9, born in Tennessee; completed 4th grade; on Apr 1 1935 was living in the same place/city; attended school. Hinchey, Frank, son, age 7, born in Tennessee; completed 2nd grade; on Apr 1 1935 was living in the same place/city; attended school. 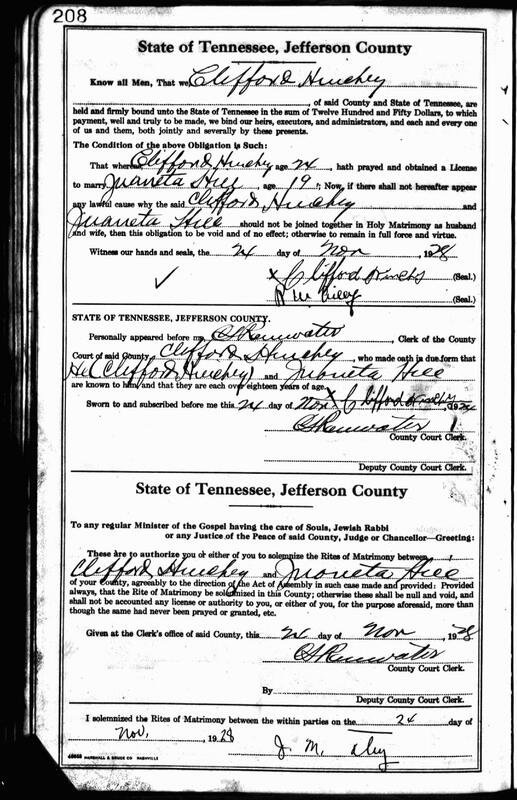 Posting 11/17/2000 by James Hinchey to Hinchey-L.
1920 census, Civil District 4, Jefferson County, Tennessee; roll T625-1748, ED 69, page 7B, line #94, dwelling #144, family #144. 1930 census, Civil District 4, Jefferson County, Tennessee; roll T626-2256, ED 8, page 11A, line #11, dwelling #197, family #200. 1910 census, Civil District 1, Jefferson County, Tennessee; ED 64, page 1A, line #32, dwelling #6, family #6.